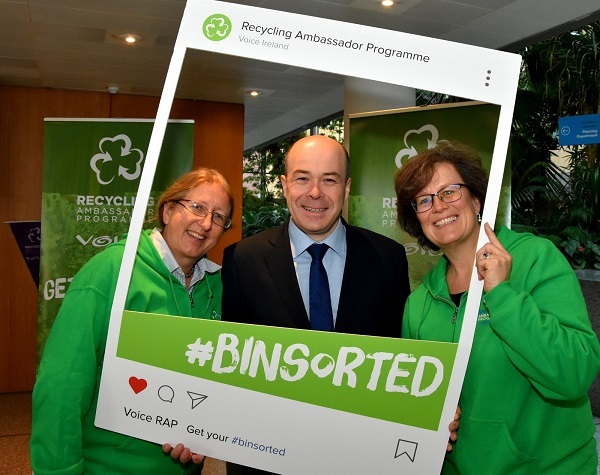 At the launch of the new Recycling Ambassador Programme in Dublin on Wednesday, were Suzie Cahn, Project Co-Ordinator for Recycling Ambassador Programme, Minister for Communications, Climate Action and Environment Denis Naughten & Mindy O’Brien, Co-ordinator at VOICE. • Government, Waste Industry and Environmental NGOs come together for clear message on suitable content for recycling bins. • Currently 28% of all material placed in household recycling bins is incorrect. 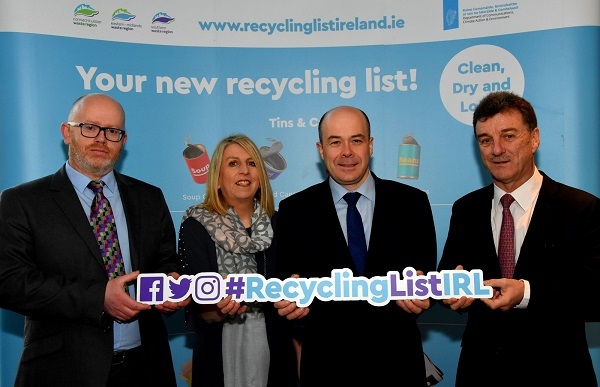 Minister Denis Naughten launched Ireland’s new Recycling Ambassador Programme on Wednesday as the Department of Communications, Climate Action and Environment, the environmental community, the regional waste management offices and the waste industry came together for the first time ever with a clear message to boost household recycling. 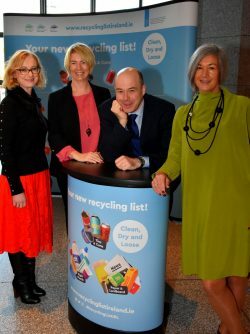 Speaking at the launch held at Dublin City Council Civic Offices Minister Naughten said, “Recycling in Ireland is evolving. We can be proud that we have come a long way in a short period of time. I believe the work of the Recycling Ambassadors will bring our performance in this area to the next level. The list of suitable material is now simply paper, cardboard, rigid plastics, tins and cans. The majority of householders have persistently shown a willingness to recycle and are extremely environment aware, but many are confused about what is suitable for modern day recycling bins. Currently 28% of all material placed in household Mixed Dry Recyclable (MDR) bins is incorrect for example food, grass, nappies etc..
A further 12 to 38 per cent of recyclable material in individual household MDR bins was found to be contaminated, according to a 2016 survey carried out by Repak Ltd, who are providing support sponsorship to the ambassador programme. At the launch of the new Recycling Ambassador Programme in Dublin today (Wednesday) were Joanne Rourke, Prevention Officer with Eastern Midlands Waste Management Office, Sinead Ni Mhainin Prevention Officer with Connacht-Ulster Waste Management Office, Minister for Communications, Climate Action and Environment Denis Naughten and Pauline McDonagh Prevention Officer with Southern Region Waste Management Office. “This contamination was caused by dirty packaging, or was as a result of liquid, food and other items that belong in the general waste bin,” explained Séamus Clancy, CEO Repak Ltd. The aim of the Recycling Ambassadors Programme (RAP), is to reduce significantly the non-recyclable material being deposited into the recycling bin, though a year long community based social marketing initiative. Managed and rolled out by environmental charity VOICE, the Recycling Ambassador Programme will host 650 workshops throughout the country to help people understand that recycling has evolved, and clarify what items should now be placed in the recycling bin. The workshops will be led by trained Recycling Ambassadors who will educate, support and encourage the public to recycle more effectively. Waste Collectors, who are members of the Irish Waste Management Association (IWMA), are also helping to spread the message, and will also provide information directly to their customers. Mindy O’Brien, Co-ordinator at VOICE, said, “We are very excited to launch this initiative! This is the first time the government, industry and the environmental community have embarked together on a national waste campaign. We hope to change the way people view waste and manage their recycling through our face to face workshops. Philippa King, Waste Plan Coordinator with the Southern Region Waste Management Office explained that the recycling process is relatively easy if householders follow some simple rules.